If I ask my two-year-old what we should have for dinner, he’ll likely reply “White wice peese, Mommy.” Since white rice is probably not the healthiest grain to be feeding him on a regular basis, the other day I set about coming up with something a little healthier that might pass for rice. My mom was coming to dinner and it was a really hot day, so I also wanted a side that was cool and refreshing. This salad was the result. I was really happy with the end product. Honestly, although I know quinoa is something I am supposed to like, I usually find it has a kind of bitter taste and is otherwise rather bland. But the honey and bright lime juice, along with the sweet and crunchy fruits and veggies did the trick. I told my two-year-old it was “quinoa rice salad with pineapple”–he loves pineapple and he gobbled it right up…the first day. On day two, he took a bite of the leftovers, spit it out and declared that it was “yucky.” Luckily, we had hummus. Rinse and drain the quinoa. Cook with water in rice cooker on the white rice setting. (Alternatively, bring the water to a boil in a medium-sized saucepan and add the quinoa. 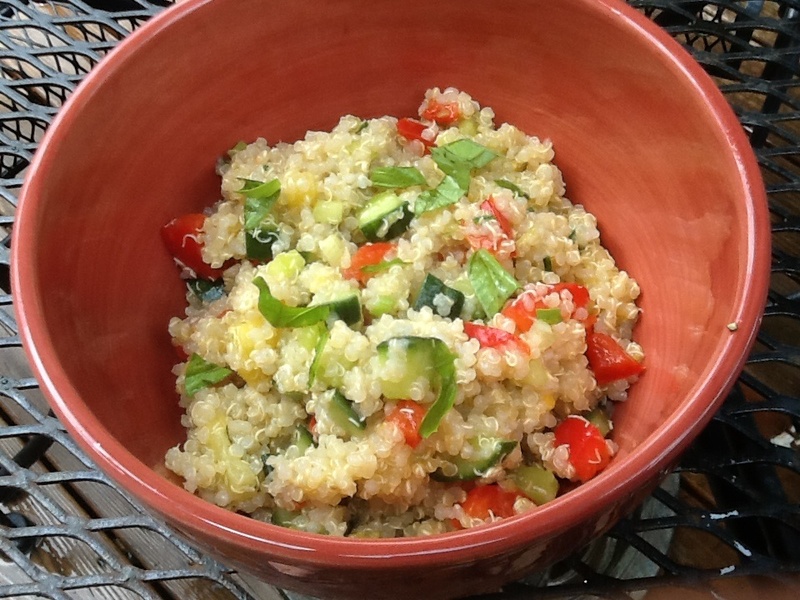 Cover and cook for 10-15 minutes, or until water is absorbed and the quinoa is tender). Dump the quinoa in a large bowl and allow it to cool. Meanwhile, in a small bowl combine the vinaigrette ingredients. When the quinoa is cool, add the remaining salad ingredients to the quinoa. Whisk the vinaigrette and toss with the salad. Serve cool or at room temperature. The base of this recipe is incredibly flexible. For example, in lieu of the pineapple and bell pepper, try blueberries and corn. Goat cheese or feta is also a nice addition, as are toasted nuts, such as chopped pistachios or sliced almonds. I am confident couscous could also be subbed for the quinoa. Heck, it would even be good with white rice.